There are already various options to add a (touscheen) display to Arduino board with software support including TFTLibrary for Arduino, and recently I tried Nextion serial touchscreen displays that are supported by a WYSIWYG editor, but the latter is only supported in Windows and not exactly user-friendly, and I found the few provided tutorials would only work with a specific resolution incompatible with the displays I had been sent. So I gave up on the idea of interfacing the display with Arduino or ESP8266 as it would be too time-consuming. 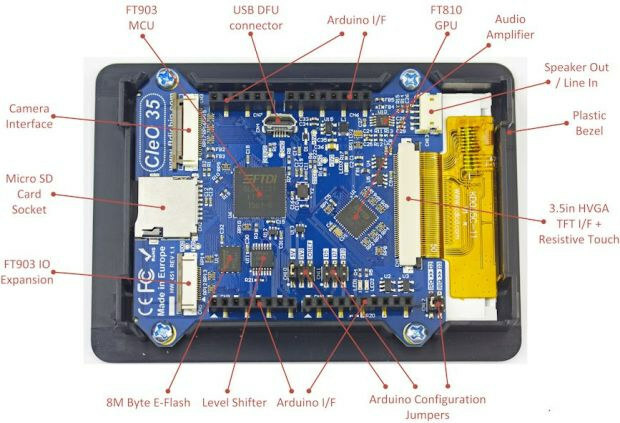 FTDI CleO project might be faster and easier to get started, as their CleO35 touchscreen display for Arduino UNO will come with a 20 chapter tutorial covering over 80 topics, and 20 projects to get started. Storage – 8MB E-Flash, micro SD slot. Fast direct file transfers between micro-SD/eFlash and the Graphics subsystem without using Arduino UNO resources. The display board is connected to Arduino UNO using SPI, one interrupt pin (INT0 or INT1), one Slave Select pin (D10, D6 or D7), 5V, IOREF and RESET and GND. 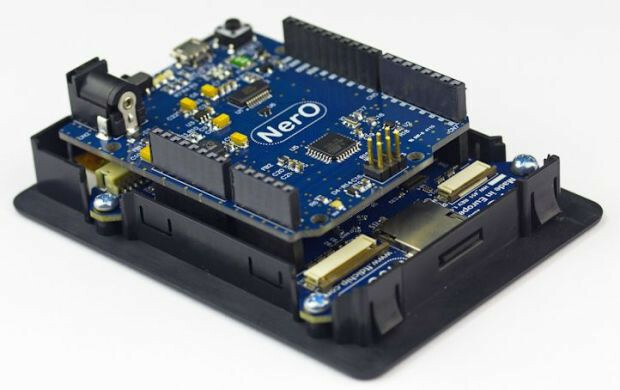 If you are going to use Arduino shields or the camera module, you may need an Arduino UNO clone with a power-efficient regulator as used in the FTDI NeRO board, or some Arduino compatible boards made by Olimex. 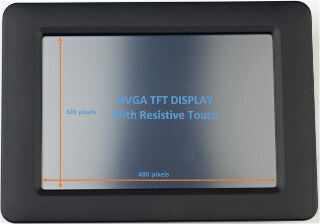 The design of NerO board (header with long pins) allows to connect it with the TFT display board, and still access Arduino headers. FTDI launched the project on Indiegogo, and they’ve reached the funding target ($7,000) with 6 days to go. You’ll need to pledge $49 for Cleo35, $63 for a NerO + Cleo35 bundle, or $97 for a bundle adding a camera module, a speaker and a 9V power supply. Shipping is not included, and adds $10 to $14 worldwide, with delivery scheduled on May 2016.